This major update and refresh is available simply by keying www.healthybeeguide.com into a smartphone or tablet. Accessing an app store is not necessary but internet access is required. The app is free to use and links to other important sources of online information. 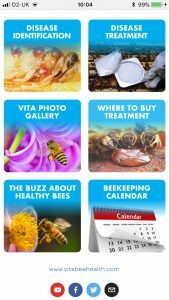 Vita Bee Health, a trading name of Vita (Europe) Ltd, is a mite control and honeybee health specialist established in 1997. It is the world’s largest dedicated supplier of honeybee health products to the honey and pollination industries. With a rigorous and ethical approach to research and development into honeybee health, Vita has no commercial interests in crop pesticides or crop breeding that may be harmful to honeybees. Vita researches, develops, and manufactures a range of honeybee health products. Its headquarters are in the UK, it has offices in Italy and Russia, works with associate company Apinov in France and with partners across the globe. These products are marketed internationally through a network of 60 distributors in 50 countries. Vita’s honeybee health product range includes anti-varroa acaricides – Apistan® and Apiguard® – wax moth controls, foulbrood diagnostic kits and health-promoting feeds. Vita also supplies Asian hornet traps, Small Hive Beetle traps, the Bee Gym varroa grooming aid and swarm lures. Vita products have been registered by more than 60 veterinary authorities. Follow Vita Bee Health as “Vita Bee Health” on Facebook and as @vitabeehealth on Twitter.